The purpose of a social network for business is to drive traffic to a particular place. When we interact socially on Facebook or some other network, we send people all kinds of places–funny sites, music videos, and games. Nothing wrong with that, of course. The chaos and spontaneity are part of the fun. A business is different. Using social networks to promote a business means you have to know what you want. Specifically, you want people to do something. Let’s say you find homes for abandoned pets. At this point, it does not matter whether it is a for-profit business or not. What is your goal? I like to explain this with a story–how I got Moose. Not a moose–Moose, a dog. The funny thing about this story is that not one bit of it involves the Internet. It does show, however, that networks can lead to good things. I took my Labrador Retriever in to the vet for a nail trim. I know, I could have done it myself, but I hate doing it almost as much as Cody (the Lab) hates having it done. The price was right and off we went. While waiting in the lobby to pick him up, I saw pictures of dogs that needed a good home. Cindy and I were not even looking for a dog, but a cute little Shetland Sheep Dog caught my eye. When I told Cindy how cute this dog was, she wanted me to go check her out. Bella, the Shetland, was already adopted when I got to the kennel, which also served as a shelter. But they told me about a no-kill shelter outside of town. Only an hour before I had not even a thought of adopting a dog, and here I was driving 14 miles just to see if there were any similar to Bella, whom I knew only through a picture. No sheep dogs or similarly cute small dogs were there. There was, however, a humongous shadow cast from the front of one pen. In it was the largest dog I had ever seen. The attendant said, “That’s Moose.” Realizing she had probably heard the response, “No, that’s a dog” before, I refrained and took her up on her offer to take Moose for a short walk around the yard. Well, one of us took the other for a walk. In the end, I called it a draw. 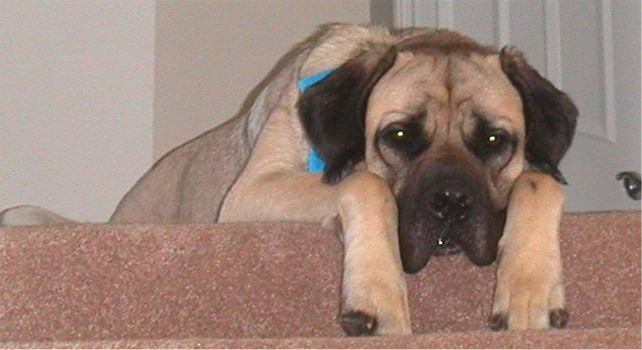 Moose, an English Mastiff who may well top 200 lbs. when he is full-grown, is now part of the Noel household. A network, whether based on the Internet or just word-of-mouth, is like gravity. Objects enter the fringes of the force and are drawn to the center. Moose, like all the other dogs needing adoption and all the people in the world and all the products and services that exist, are centers in their own right. He just happened to ensnare me because I randomly looked at a picture. From there to a kennel and from there to a shelter and from there to a fabulously happy outcome. When you make yourself a specific center of gravity, you draw people in. Had the shelter not put pictures in my vet’s office, I would never have even known about Moose. They knew what they wanted– a good home for Moose (and all those other wonderful dogs). And that’s exactly what they got. As you start your business, think about all the people floating around in the world doing what humans do. Figure out how you can make their lives better by providing something of value. Then, get specific. Become a center of gravity. Terry loves Moose. His wife thinks they are soul-mates. Terry is not quite sure what she means by that.